Hello everyone. It’s Mixology Monday, and this month’s theme is “From Crass to Craft”, and it’s being hosted by Scott at Shake, Strain, and Sip. It turns out, there are quite a few cocktail blogs with names made of common bartending verbs. James and I were inspired by a shot called the Oatmeal Cookie, which is made with equal parts of buttershots, cinnamon schnapps, and Bailey’s. I wanted to create this drink without using any of those things, so we found alternative routes for bringing all of those flavors together. For the cinnamon and butterscotch, I infused a cinnamon stick and four Werther’s Originals into eight ounces of bourbon until the candy was dissolved, about ten hours. It was surprisingly not disgusting, although there is a little bit of processed milk in the candy, which will separate from the bourbon if you let it sit for a while. It’s not a big deal, and it integrates nicely into the drink when shaken. For the Bailey’s, we used this recipe from Serious Eats as a reference, and used it to build the other ingredients in the drink. We did not take all of the flavors from the Bailey’s, but we got the important ones, specifically chocolate, coffee, cream, and almond extract. 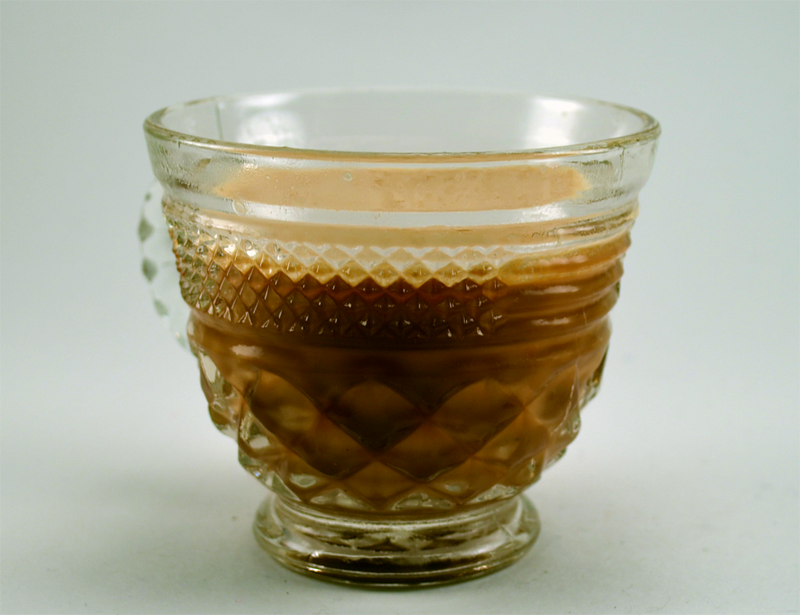 We omitted the honey, vanilla extract, and condensed milk, and reasoned that the bourbon base of the infusion was a good stand-in for the whiskey base of the Bailey’s. Dry shake (to froth the cream) and then shake over ice and strain into a cocktail glass. No Garnish. This drink accomplished its purpose; specifically, it tasted like Bailey’s, Butterscotch, and Cinnamon. For that matter, it did taste vaguely like an oatmeal cookie. 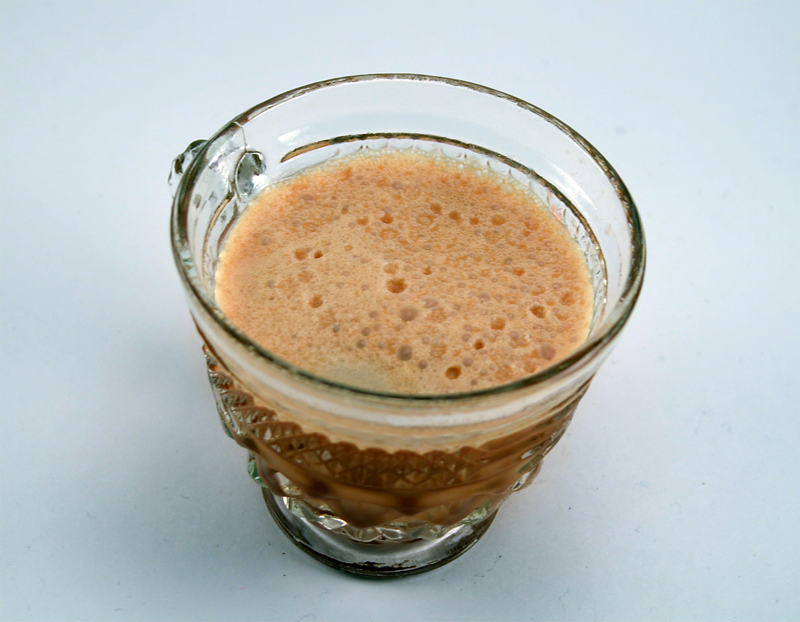 Even though the ingredients were craft, with the exception of the butterscotch candy, the drink could not escape its origins; it was sweet, and even though we used a “deconstructed” Irish Cream, it still tasted Irish cream, which is a flavor I try to avoid. Categories: modern drinks | Tags: alcohol, bailey's, bartending, booze, butterscotch, cinnamon, cocktail, cocktails, craft, craft cocktails, drinking, drinks, irish cream, liquor, mixed drinks, mixology, mixology monday, oatmeal cookie, spirits | Permalink. Cereal Milk is trending these days, and I figured I would hop on the trend, because that’s what drives them hits (theoretically? ), and because I was intrigued by the idea. Probably the most famous cereal milk is from Momofuku in New York City, and indeed, I was inspired by this Cereal Milk Punch from PDT. For their recipe, they use cornflakes toasted with sugar, and I respect that, but I am lazy, and I selected an already sugar-laden cereal, and dropped it right in. Making cereal milk is not exactly rocket science. Hell, most of us do it unintentionally every morning. I used Special K Red Berries, because I get down like that. It has freeze-dried strawberries in it, so I was looking for a little bit of a fruit flavor. It was not very perceptible. Dry shake, then shake over ice and strain. Garnish with grated nutmeg. I used the good bourbon, for this one, because I was out of my well. 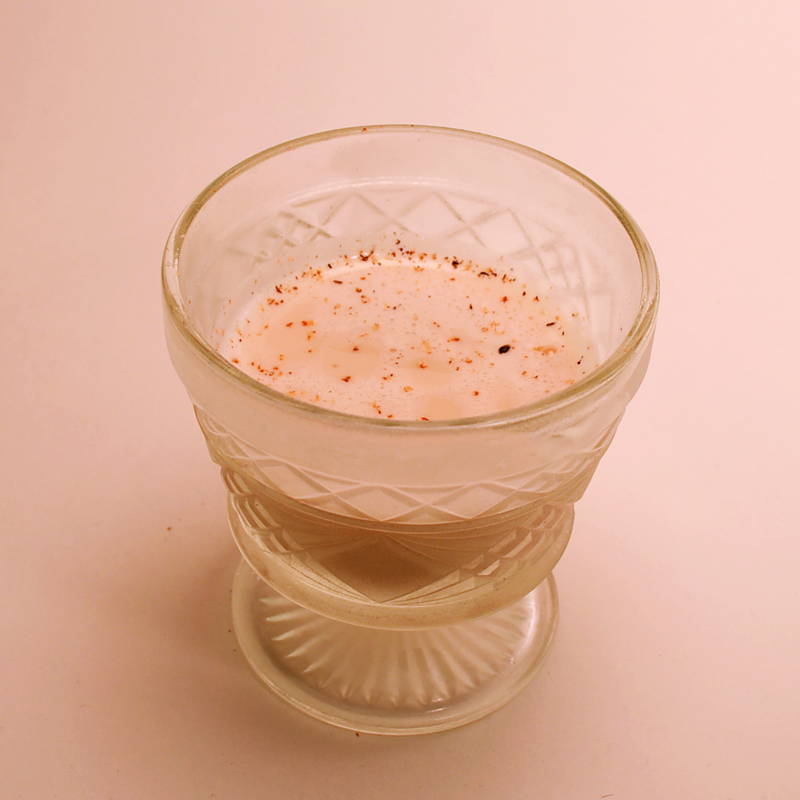 I think what I would really like to see in a cereal milk punch is some white dog type of whiskey. The cereal flavor is delicate, and the dark spirits don’t cover it up, but neither do they let it shine as the star of the drink. To make the cereal milk, I added roughly equal parts of cereal and milk to a bowl, allowed it to sit for twenty minutes in the fridge, and then strained it through a fine-mesh strainer. The milk became slightly thicker, but the texture was not spoiled by any cereal particles. This is a fad that does not really impress me, but maybe you’ll come up with a cooler idea. Cheers. Categories: modern drinks | Tags: alcohol, bartending, booze, bourbon, cereal, cereal milk, cocktail, cocktails, drinking, drinks, infusion, liquor, milk, milk punch, mixed drinks, mixology, momofuku, PDT, punch, rum, spirits | Permalink. We’ve been trying to explore new and interesting fortified wines, so the other day I picked up a bottle of Byrrh. I was expecting it to be sweet vermouth, but it is much more reserved in its herbal qualities, and its primary flavor is much closer to grape juice, or maybe to port. It has that same deep, sweet, raisin quality that one finds in a ruby port, but perhaps it is not quite as complex. Anyway, I got it into my head to make a long drink, and it tasted like wine soda; dry, crisp, and refreshing. I like the combination of cherry and grape, so I used Byrrh as the base, modified it with Cherry Heering, and cut the sugar with a quarter ounce of lemon. The result was very approachable, I think. Shake all except soda water over ice, then double strain and top with soda water. 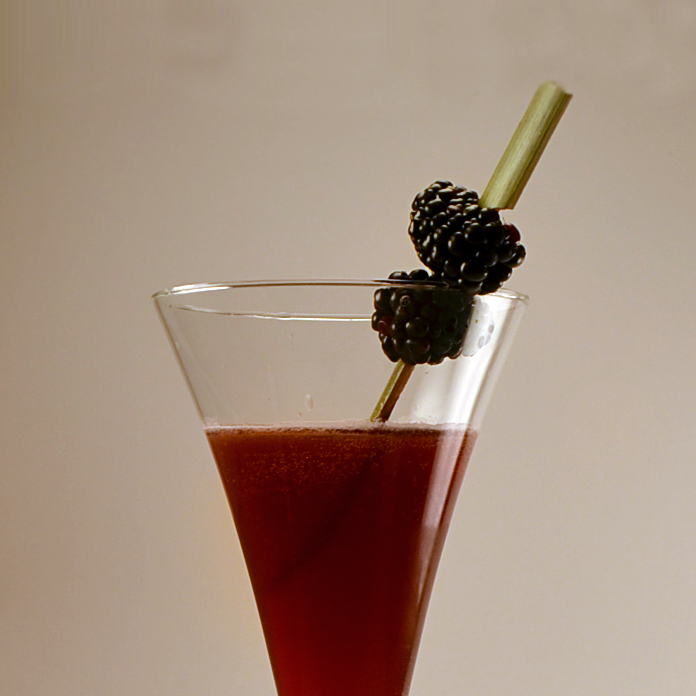 Garnish with skewered blackberries. I did not have a lot to say about this one, but you could probably sub the Byrrh with Stone’s Ginger, or Sweet Vermouth, and still have something very enjoyable. Categories: modern drinks | Tags: alcohol, bartending, blackberry, booze, Byrrh, cherry, cherry heering, cocktail, cocktails, craft cocktails, drinking, drinks, fortified wine, garnish, heering, highball, lemon, liqueur, liquor, mixed drink, mixology, punch, soda water, spirits | Permalink. Alright, we’ve been getting a little too crazy around here. It’s time to dial it back and make something classic. Fortunately I’ve had a bottle of Berneroy XO Calvados burning a hole in my bar, and it’s so delicious it’s almost like cheating. It’s not quite as assertive as Laird’s Bonded Apple Brandy, which is my default for these kinds of drinks, but it has a very round, complex apple flavor, with a perfect balance of oak and vanilla from aging. Building off of that fine Calvados, I made some grenadine using Jeffrey Morgenthaler’s recipe. I had used this process before, but I had omitted the pomegranate molasses. This time, I managed to procure some, and the difference is astonishing. Unlike sugar cane molasses, pomegranate molasses is tart and raisiny, and it transforms the grenadine from a mere pomegranate syrup into something reminiscent of a lime cordial, except with pomegranate. After tasting this style of grenadine, I will never go back. Shake over ice and double strain into a cocktail glass. Garnish with a lime wheel. I think a classic Jack Rose is made with lemon, but I have tried both variations and I prefer mine with lime. As much as I like mixing Spinach and Orgeat, drinks like the Jack Rose have endured for a reason. They are delicious. 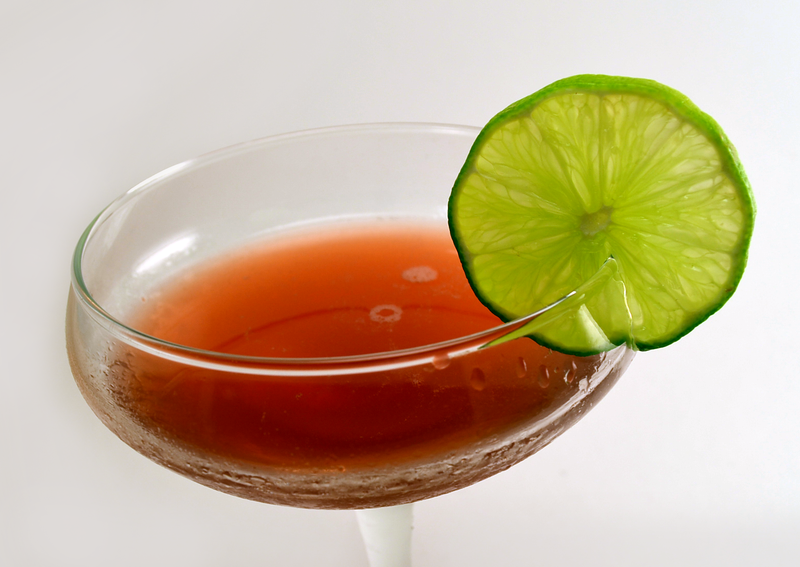 Categories: classics | Tags: alcohol, apple brandy, applejack, bartending, booze, brandy, calvados, classic cocktail, cocktail, cocktails, drinking, drinks, grenadine, jack rose, lime, lime juice, liquor, mixed drink, mixology, pomegranate, pomegranate molasses, sour, spirits | Permalink.